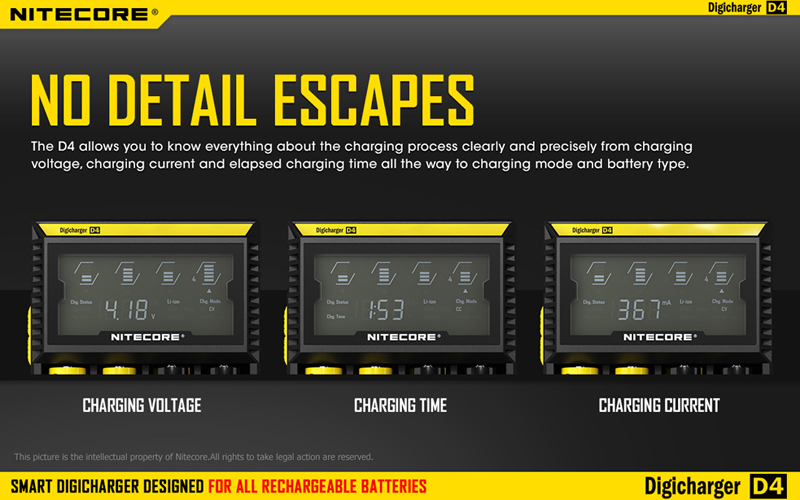 For 26650, C size, you can charge upto 2 pcs at a time. For example, use channel 1 & 3, or 2 & 4 or 1 & 4. Need cells ? 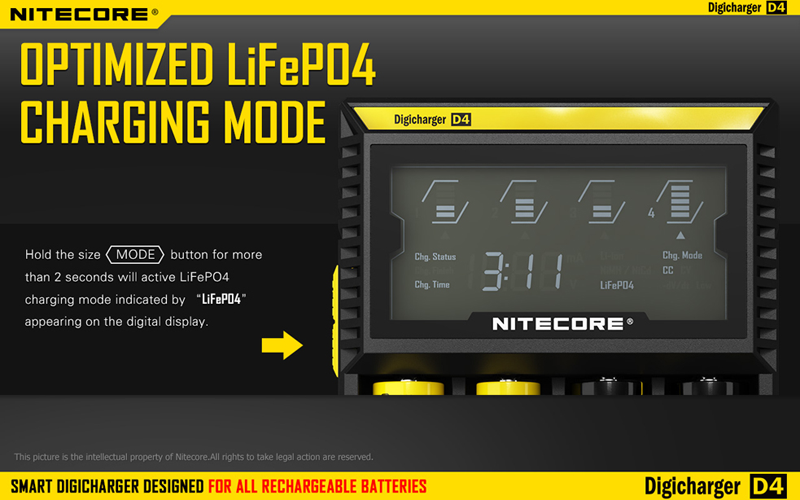 You can order LiFePO4 cells and Li-ion cells. AC 100-240V 50/60Hz 0.35A(MAX) - Power Cable included. Insurance Insured worldwide by Ping An Insurance (Group) Company of China, Ltd. 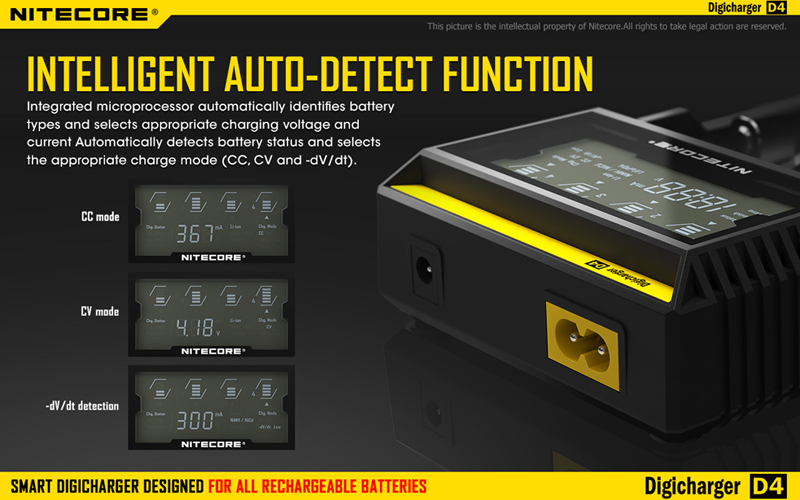 The D4 is compatible with batteries of varying sizes, therefore when charging certain batteries (such as 26650 and AAA), manual adjustment of the battery’s position within the slot is recommended, as to ensure solid contact is made between both sides of the battery and the charging slot’s metal contact points. 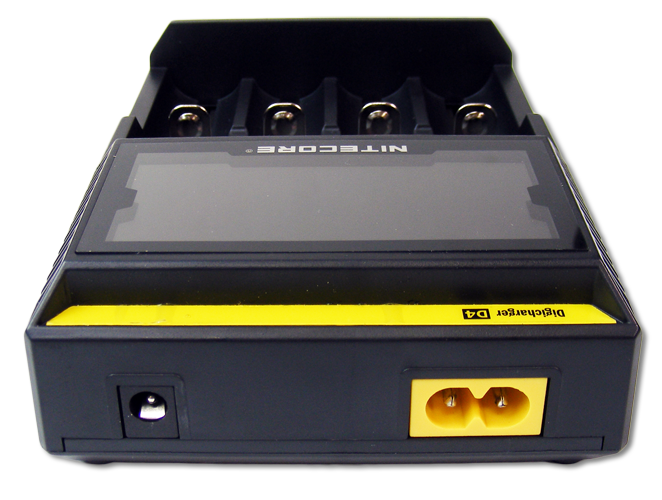 The D4 is restricted to charging Li-ion, IMR, LiFePO4, Ni-MH/Ni-Cd rechargeable batteries only. 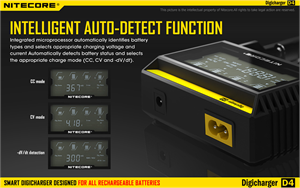 Never use the D4 with other types of batteries as this could result in battery explosion, cracking or leaking, causing property damage and/or personal injury. 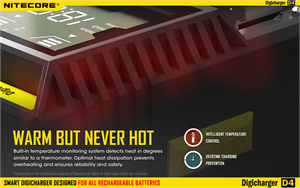 The D4 should only be used indoors or inside a motor vehicle and under no circumstances should it be exposed to water, high humidity and low or high ambient temperatures. Do not disassemble or modify the charger. Children under the age of 18 should be supervised by an adul t when using the D4.